Despite its relatively abundant water resources, Lebanon is significantly water-stressed with water availability falling short of international standards by over 150 m3 per person every year. 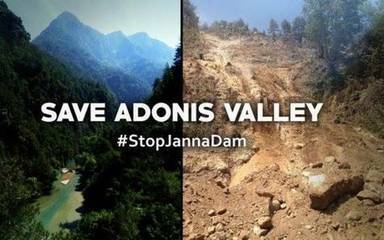 According to the government's plans, to alleviate the country’s water problems, the Janna dam project was approved as part of a wider strategy across the country in 2009 and its construction effectively began in 2013. The dam will have a capacity of 38 cubic meters and will supply the region of Byblos as well as the northern part of Beirut and its suburbs. In addition, the site will also include a hydroelectric power plant supplying the grid with electricity. The project will take place in a region called the Adonis valley, where the Abraham river passes. Home to many natural springs and more than 700 species of animals and plants, some of them endemic, it’s considered to be one of the most biodiverse areas of the Middle-East. In addition to its high ecological value, the Adonis valley has always been an area of important cultural significance. The valley, named after the Phoenician deity Adonis, has many temples and Ottoman-era water mills scattered along the banks of the Abraham river passing through. The project is said to have impacts on various levels. Hydrologically-speaking, the dam will affect river flow and disrupt the vast underground network of aquifers feeding the Jeita spring and significantly draining it. This spring is Beirut’s main water source and of utmost importance for the underground rivers passing through the Jeita caverns. In addition, the carbonate rocks of the area form karst containers, a permeable geological structure that makes water retention very difficult and is hence not suitable for building a dam. 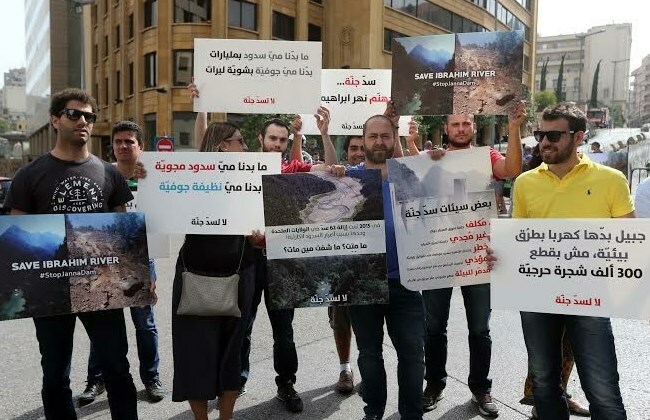 Thousands of trees have already been chopped down and hundreds of thousands more are projected to follow suit, causing erosion, destruction of habitats and whole ecosystems including the 16,000 acre Jabal Moussa Biosphere Reserve, a few miles downstream of where the dam is being built. The reserve, a UNESCO-recognized biosphere, is recognized as a protected by the Ministry of Agriculture. The whole process has been very ambiguous and secretive, as information about the project was not made public or easily accessible including the two Environmental Impact Assessments Reports on which the construction decision was based. The construction also began before the presentation of these reports to the public during a consultation that took place on September 25, 2014. Lebanon Eco Movement, a network of Lebanese environmental associations, has been the front runner in campaigning against the construction of this dam. Using drone footage, the movement could show the extend of the destruction caused by the construction works. On May 31 2016, they were able to fly a drone above the construction site showing the public that the construction works have not stopped despite the order of cessation issued a few days before. Under pressure, the construction was suspended in May 2016 pending a final decision, only to resume a few days later despite the order of cessation. Project Details The dam is expected to have a fixed storage capacity of 38 million cubic meters and a mobile storage capacity of between 80 and 90 million cubic meters. The dam will provide around 700,000 people (Within the Jbeil and Northern Beirut areas) with drinking and irrigation water as well as generating 4 MW of Energy. Why? Explain briefly. Not enough pressure was exerted for the project to be stopped completely. The cessation order was not applied. In addition, no serious alternatives were proposed by activists. The project also had a lot of proponents even from the region where it is being built, including mayors. It is also important to note that the whole process was very shady and secretive, making it difficult for activists and opponents to get information about the project.